Sherwood's Notebook: Damnable Inaction and Silence? A 77-year-old man is dead. And his daughter watched him die. She had waited in vain for help from a firehouse that was just across Rhode Island Avenue NE. The help never came. Personnel at the fire station did not respond to screams for assistance. “It’s outrageous,” said Mayor Vincent Gray, speaking to reporters last week about the sad tale of Medric Cecil Mills. Mills was a four-decade employee of the city’s Department of Parks and Recreation — still working. He had a heart attack on Saturday, Jan. 25, when he was on an errand with his daughter Marie. “I know his daughter wants to see justice done. I’ve talked to her twice,” the mayor, who has ordered an investigation, told NBC4 this week. “We think in the next few days this will be concluded, but I don’t want to set a date,” he told Mark Segraves, commenting on the situation that was first disclosed by WTTG’s Paul Wagner. Deputy Mayor for Public Safety and Justice Paul Quander similarly has expressed shock that first responders didn’t respond in what appeared to be an obvious emergency situation. But no one (as of our deadline) has heard from Fire Chief Kenneth Ellerbe. Last week we sent emails to the fire department asking for Ellerbe to comment. “He’s the fire chief and to my knowledge has not said anything about the Rhode Island firehouse matter,” we wrote to the media relations office. “Chief Ellerbe is unavailable for comment,” came the initial response. We pointed out that Ellerbe had said nothing even though Gray and Quander had. “Correct, Chief Ellerbe has not commented on the incident,” came the terse reply. So this week, NBC4’s Segraves asked Mayor Gray about the chief’s silence. “Any reason Chief Ellerbe hasn’t spoken about this?” Segraves asked. 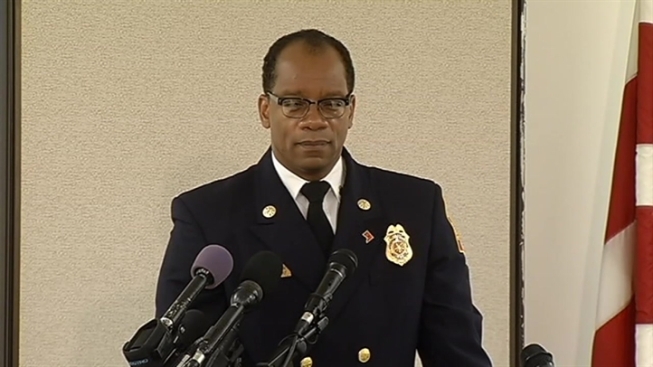 Ellerbe has been the focus of extensive complaints about his handling of various fire department issues. He’s addressed a lot of them, whether you agree with his explanations or not. But his silence on this incident troubles many people. The Beatles’ first U.S. concert was right here in the District of Columbia at the old Uline Arena near Capitol Hill. The venue later fell on hard times. Its cavernous insides for many years served as a smelly garbage transfer station. But next week the Uline Arena will live again. Developer Doug Jemal ultimately is turning the site into a mixed-use project. But for one sweet night, he’s re-creating the Beatles scene as a fundraiser for the D.C. Preservation League. A Beatles tribute band will perform the exact set played 50 years ago. One of the original opening acts — Tommy Roe — will be there, too, to re-create his set. Mayor Gray grew up not far from the Uline Arena. As a youth, he had a summer job delivering ice for owner Mickey Uline. There was an ice skating rink, too, one of the few places in the city you could skate. Was Gray at the Beatles concert? Nope. Segraves, who was interviewing Gray about this, too, noted that the tickets were only three bucks. “Well, if you go back in those times, three dollars was a lot of money,” said Gray. ■ Colorful cabs. The Taxicab Commission reports that more than 740 taxi drivers have agreed to repaint their cabs earlier than required. The drivers are responding to a $200 discount being paid by the city. Thousands of new and older cabs are switching over to the red and gray colors that also appear on the Circulator buses. It’s part of the city’s effort to create a more definable taxi system. Right now, many cabs come in a rainbow of colors, making it difficult to know you’re actually getting into a licensed taxi. ■ Next up, Muriel Bowser. The Hill Center on Capitol Hill will host Ward 4 D.C. Council member (and mayoral candidate) Muriel Bowser Monday at 7 p.m. It’s the latest in a series of conversations your Notebook is having with public officials, elected and appointed. Your Notebook and Segraves will talk personal history, policy and politics with Bowser for an hour. For details visit HillCenterDC.org.